Here are some guidance tools designed to support you to develop a strong application for UK Aid Direct funding. 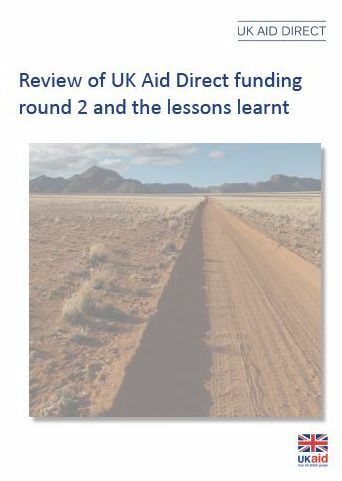 This updated guidance breaks down all the factors grant holders should consider when designing a project for UK Aid Direct. On 26 February 2019, Fund Director for UK Aid Direct Karen Stephenson hosted a webinar to potential applicants for Community Partnership and Impact grants in the upcoming general funding round. Joining her were existing grant holders, Richard Grenville from Send a Cow and Lauren Watters from AbleChildAfrica. David Bailes, Head of Fiduciary Risk for UK Aid Direct also gave advice on budgets, expectations and the due diligence process (for applicants invited to submit full applications). This is a copy of the presentation slides used in the webinar on 26 February 2019 for potential applicants of the Community Partnership and Impact grant funding round to download. This is the first publication in the User Guide series, a learning resource compiled in collaboration with the UK Department for International Development (DFID) and the Washington Group. The User Guide is a narrated video on the UK Aid Direct Youtube channel, which provides information and advice on how groups can improve reporting on disability. We have compiled a lessons learnt document to profile: general feedback on the full applications received for Impact and Community Partnership grants during the November 2016 general funding round. We hope this is helpful for organisations considering applying for a UK Aid Direct grant in the future.